We are almost 24/7 on Social Media. Right from the moment we wake up, we check our smartphones. And finally when its time to say Good Night, we do the same. Social Media had surely changed our pattern of life. As a candidate how does this help me? Will it help me find a Job? Well, surely it can help you find a job. 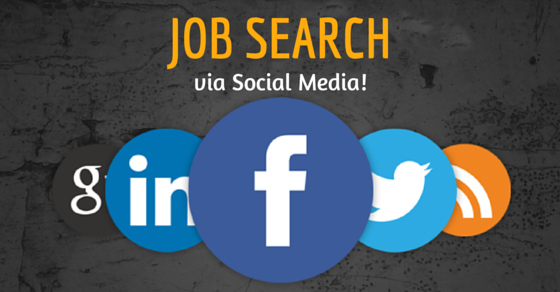 Recruiters are now a days more active on various social Networking Sites. And this provides candidates a great platform to make themselves visible and approachable. Interesting Right. So now that you know Recruiters are also looking for prospective candidates on these media and networking social sites, let’s check some ways via which you can locate relevant jobs for yourself. Twitter is an interesting place where people follow, read, blog, connect and share topics that they like. Its an amazing world of 140 characters. Now you would wonder how can I find jobs when there is a limited space to write. Don’t you worry. All you need to do is identify your target companies, follow them, check their tweets and that’s it. Companies are now a days very much active on Twitter. They Tweet about Job Opportunities, Company Events, Walk-In Drives, Employee speak etc. They are slowly bringing their companies culture online for you to know more about your future company. Also Recruiters are using Twitter Advance Search to find Relevant Bio’s that match their requirement. So ensure that you make the most of your 160 characters space of Bio when doing twitter job search. Use # Hashtags and relevant keywords in your bio that will help recruiters to find you easily. And yes most important, do follow Influencers on Twitter related to your area of Interest. As its all about Networking these days. You can find Jobs on Facebook? Yes you can. Had I mentioned these some years back, you would have not believed me. But things have rapidly changed. Now you can enter your company details and your designation on your Facebook Profile. This helps companies and recruiters to find you for their current Job Openings. Recruiters are using Facebook job Search to find candidates. Searches such as “People who work at XYZ company in XYZ Location” or “Assistant Managers working in XYZ Company” Help recruiters to search you. So ensure that you update your company details and Designation on Facebook. Also do follow your favorite company page on Facebook. As now a days its common for companies to have a Facebook Page. These Pages helps companies to connect and engage with prospective candidates like you. No doubt LinkedIn is an amazing place for you to find jobs. But is your LinkedIn profile complete? Does it mange to impress the recruiters? If your answer is NO, then you really need to start working on your LinkedIn Profile. You can start with your Professional Headline and Professional Picture. Ensure that you provide some contact information (Mail Id or Number) that will help recruiters to approach you. Do make the most of the Summary Section in your profile. Ensure that you write about your role, your achievements, awards etc. These things does make a positive impact while reading your resume. Also it would be great if you can list min 2-3 Recommendations from your current or previous employer or employees that you have directly worked with. Social Media and networking is a platform that will help you. That does not mean its easy passage to find jobs. You need to work on your Brand. Make yourself visible. That does not mean you need to pay agencies money to make your profile look attractive. All you need to do is use right keywords and be active on right Social Media platforms or Channels. Follow Companies, Recruiters and HR Professionals and try to connect and engage with them, even when you are not looking for Job. This will help you not only in the short run, but in the longer phase too. And soon there will be a phase when you don’t have to find jobs, recruiters will find you via Networking Site. So what are you waiting for? Go ahead find your dream job or let recruiters help you in finding it for you.